After you’ve seen the castle and walked down the Royal Mile it’s time to get to know the other side of Edinburgh. Truth be told, it had not always been the pleasant and family friendly city we find it today and you will not find much street art on its sandstone town houses. But don’t despair, there’s still plenty to do. The Scottish capital has so much more to offer than just tartan, bagpipes and haggis (local delicacy). With its curious mix of medieval and classical architecture, rich cafe and restaurant culture, mountains and sea, Edinburgh will please and surprise most visitors and it simply is a great place to live in. It can be easily explored by just by walking around at a strolling pace. It’s geometrical, it’s beautifully built and it’s a UNESCO site. Here is a short story about New Town: in medieval Edinburgh rich people and poor people used to live in the same buildings perched along the Royal Mile, which extends from Edinburgh Castle to Holyrood Palace. It wasn’t pretty. Water and excrements used to flow down the pavements and diseasess spreaded quicker than fire. After some time the rich folk have had enough ad build themselves a New Town north of the Old Town. They made sure that their social position will be reflected in the grand architecture. 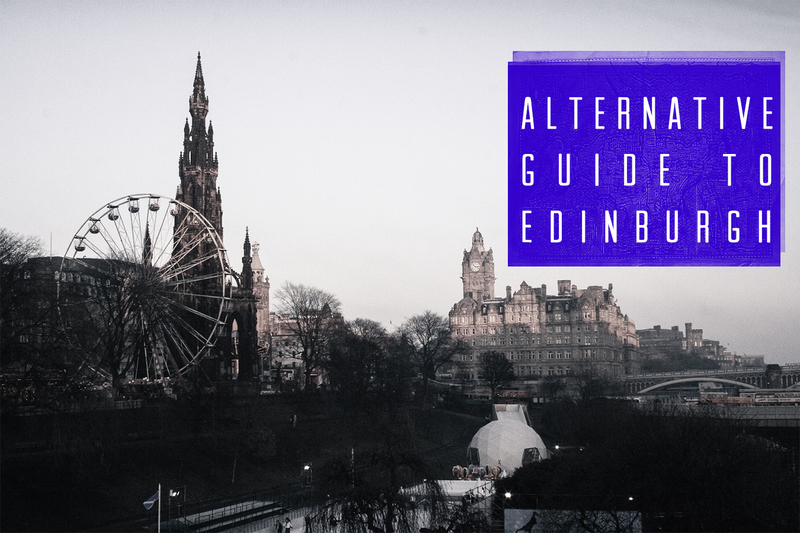 Now the place is a home to middle and higher class Edinburghers, art galleries, coffee shops and private gardens. It’s very pleasant to the eye and in the evening you can spot music sheets on the grand piano or a lady reading poetry in a grand drawing room through the window. A village in the middle of a city, built along the Water of Leith. You’ve never seen anything like this before. It used to be a heart of the milling industry, remnants of which are still visible along the river. Start the walk next to the Gallery of Modern Art and walk all the way to the impressive Dean Bridge. The path gets a bit muddy on a rainy day. Edinburgh has plenty of those on offer. Museum of Childhood, The Writers’ Museum and (my favourite) Surgeon’s Hall Museum are all worth visiting if you have a few hours to spare. The last one is not for the faint-hearted. Old obstetric instruments, body parts in jars and books made of human skin. Yes you read that right. So many reasons to visit! If you’d like to see what 1 million pounds looks like in person, visit the Museum on The Mound. Because, why not? It calls itself “boho” but it really is a middle class family friendly neighbourhood with cheese and wine shops, lovely coffee shops and a couple of good places to catch a bargain. On Sundays there is a small lovely Farmer’s Market and recently a new branch of my favourite cafe Artisan Roast opened there as well. Visit to see how people live in Edinburgh but don’t expect artistic feel or street art. This used to be a fisherman village, a busy port located North of Edinburgh and a place of social changes in Scotland. Now it’s a place where brick-stone buildings are being converted into art centres and Michelin starred restaurants are opening. I’m yet to discover this district in more details but from what I hear it’s the closes to boho feel Edinburgh has ever gotten. Start with a coffee in Broughton Street and then hop on the bus to the Shore. Another lovely neighbourhood nested between the Meadows park and the Southside of Edinburgh. It has a range of great coffee shops, independent shops and interesting residential architecture. Interesting fact: on street just off Bruntsfield used to be called Writers’ Row because writers such as Iain Ranking, Alexander McCall Smith and J.K Rowling used to live there. It’s worth passing through this neighbourhood if you’d like to see the Wild West of Edinburgh – a little street which looks like a film set from a Western film. This inactive volcano hovers of Edinburgh City and contributes to its iconic skyline. It’s popular with joggers and dog walkers and apart from panoramic views offers a chance to feel like in the mountains even though you’re still in the capital of Scotland. The 250 m climb is relatively easy but can be slippery in wet conditions. If the sun is out, grab a portable grill, burgers and a bottle of Cider from Tesco and join tens of Edinburghgers on the Meadows. There may be a couple of circles of people with long hair and drums, young mums with babies and groups of students. You’ll fit right in. Bus 15 takes you directly to Portobello beach. A lovelyway to spend an afternoon. There are some nice eateries along the beach as well. Since being featured in the Da Vinci Code the Rosslyn Chapel has gained a fair few new visitors and a new information centre. The chapel is beautifully carved and the guided tour unravels many mysteries associated with its structure. Calton Hill is located at the east end of Princess Street and is the reason why Edinburgh is sometimes called the Athens of the North. On a good day the view from the top extends all the way from the Firth of Forth Bridge to the Bass Rock. Blackford Hill is an alternative to Calton hill, more popular with locals and dog walkers. The hill is located between Grange and Morningside neighbourhoods of Edinburgh and offers a beautiful view at sunset or sunrise. It can be windy at the top so take a jacket. Rather than giving you a comprehensive review of the best Edinburgh restaurants I will simply list some of my favourite places I’ve visited time and time again. A few places listed here are raved about by people I know in Edinburgh but I haven’t tried them myself. I will mark those with a *. Artisan Roast, 138 Bruntsfield Place, 100a Raeburn Place and 57 Broughton Street – the best coffee in Edinburgh, freshly roasted on site. Don’t be put off by a beanie wearing baristas. They are all lovely. Brew Lab, 6-8 Suth College Street, consistently amazing coffee. If you’re after a perfect cup of flat white or a cold brew – this is a place for you. Cult Espresso, 104 Buccleuch Place, a relatively new addition to the coffee scene, meticulous attention to detail and beautifully hand crafted coffee. Worth visiting. Lovecrumbs, 155 West port, the best cakes in Edinburgh. Cuckoo’s Bakery, 150 Dundas Street and 116 Bruntsfield Place, the best cupcakes. Better than NYC Magnolia bakery in my opinion. Mary’s Milk Bar, 19 Grassmarket, fresh gelato and chocolate. Two reasons for visting. Cafe Class, 7 Home Street, a low-key informal cafe with Latino music in the background. Favourites: beacon roll or full Scottish Breakfast. Milk, 232 Morrison Street, simple white-tiled cafe serving a good range of breakfast and lunch dishes. OK coffee. The Dogs , 110 Hanover Street, simple well-priced italian food. Great for lunch or dinner with wine. Ting Thai Caravan, 8-9 Teviot Place, great reasonably priced Thai street food. It’s always full so you may need to wait for a table. The Mosque Kitchen, 50 Potterow, so many people I’ve spoken to rave about this place. Great food and cheapo prices. This recently refurbished recently museum and collection is absolutely amazing. From history, to design, astronomy, art and animal kingdoms – it makes for a perfect morning especially if the weather is typically Scottish i.e. constant rain. (Insider tip: go to the top floor roof terrace for a great view of the castle and Edinburgh skyline). As you enter turn right and go to the children’ section to see the real Dolly the sheep. She was the first cloned animal in the world and now she’s on display in the museum as a part of exhibition. Cameo Visit the bar for a drink before the film. Filmhouse You can take a drink (including alcohol) with you to the cinema. Great for a date. Leo’s Beanery in Howe Street. Lovely place in one of the converted basement flats. Good coffee and lovely cakes and reasonably priced soup. If you’d like to truly immerse yourself in Scottish culture, a Ceilidh is what you need to put on your itinerary. Ceilidh dancing is a type of traditional Scottish dancing, usually in groups of 4 or 6, under direction of a Ceilidh band which includes a few fiddle (violin)guitars and drums. The band will explain the steps before each dance and you will quickly find your feet among tartan clad Scotsmen. It is tremendous fun and I would highly highly recommend it. Don’t worry at all about not knowing the steps, everyone is super friendly and you’ll be dancing away and having fun in no time. Every Saturday, a hand-picked 5-piece of excellent jazz players is brought together for the first time. With a different selection of musicians each week, it’s always a ‘surprise’ line-up – even for the players! Some of the best stand up comedy clubs in the city. Scottish sense of humour is unrivalled. Go and see for yourself. This is a famous improvised comedy show performed in a student theatre Bedlam, which has been running in Edinburgh for over 25 years. I’ve been to the show 4 or 5 times over the years and found it hilarious each time. Various improvisation games based on audience suggestions give rise to a hilarious and unique show every time. They also perform yearly at the Edinburgh Fringe and are notable for being, at 25 years, the Edinburgh Fringe’s longest running improvised comedy show. Ticket’s usually sell out very quickly, so book in advance. If you have any questions or your favourite places in Edinburgh, feel free to add them in the comments. Next PostSzybkie przyjemności. Poezja smaku.